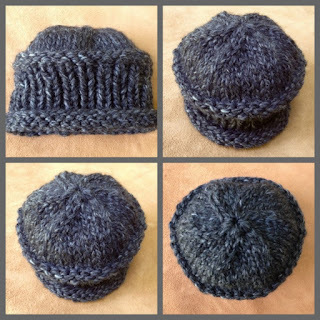 I knitted this hat with rolled up edge in about 2+ hours. 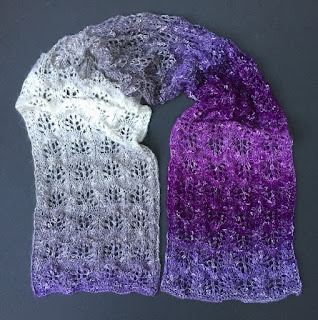 It is a great quick knit for last minutes gifts. I had a lot of fun with this shape, so I knitted two hats. Originally I designed it for a six to eight year old child, however the youth size can stretch up to 20". It is 7" tall rolled up. My second hat is slightly bigger - big enough for an adult. I changed pattern just a little to adjust for a bigger size. Although it is only 7.5" tall when rolled up it can "sit" on someone's head as a "fashion statement" - you know slightly pushed back in a cool and relaxed way - see for yourself at the bottom of my post where I am playing a cool model. Yarn - 1 ball of Super Bulky #6; I used Lion Brand, Wool Ease, Thick & Quick; 106 yrd/97 m; 6 oz/170 g; color "Charcoal"